Charles Messier added M57 (NGC 6720, Ring Nebula in Lyra) to his catalog. The true structure of the object has only recently been discovered through observation by the Hubble space telescope. Telescope maker Alvan Clark and his son Alvan Graham Clark discovered the dwarf companion of the star Sirius while testing the optics for a new refractor they had been building for the University of Mississippi. J. Palisa discovered asteroid #232 Russia. K. Reinmuth discovered asteroids #1015 Christa, #1016 Anitra and #1056 Azalea. US Navy Captain Ralph S. Barnaby made the first glider flight from a dirigible, a 12 minute journey launched from the airship USS Los Angeles 3,000 feet over the Lakehurst Naval Air Station, New Jersey. NASA launched Mercury-Redstone 2 with the chimpanzee "Ham" aboard on a suborbital flight. Mercury-Redstone 2 (MR-2) was launched 31 January 1961. 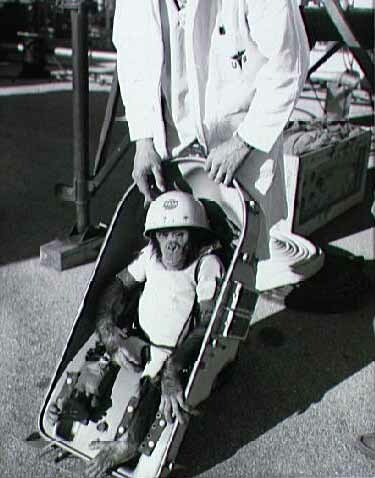 It was the third attempted flight of the Mercury/Redstone launch configuration and the first to include a living organism, a 17 kg chimpanzee named Ham (in honor of the Holloman Aerospace Medical Center). The basic flight objectives were: a suborbital flight; acquisition of physiological and performance data on a primate in flight; and systems qualification tests. The flight was successful; early depletion of liquid oxygen in the launcher triggered the escape rocket, which yanked the spacecraft 209 km beyond the recovery area. When MR-2 splashed down, no ships were in the vicinity, the capsule having landed some 100 km from the nearest recovery ship, the destroyer USS Ellison. A P2V search plane located the capsule about 27 minutes after splashdown, and helicopters were dispatched from the USS Donner, since at least two additional hours were still required for the Ellison to arrive. When the search plane located the capsule, it was floating upright, but by the time the helicopters arrived, they found MR-2 on its side and taking on water. Ham was returned safely to the Donner, apparently no worse for the wear. Quoting the NASA page, "Sometime later, after his flight, [Ham] was shown the spacecraft and it was visually apparent he had no further interest in cooperating with the program." The US Air Force successfully launched the SAMOS 2 spy satellite as a step toward replacing U-2 flights. USSR launched Luna 9, the first spacecraft to successfully soft-land on the Moon. Luna 9, launched 31 January 1966, was the first spacecraft to successfully achieve a soft landing on the Moon, and to transmit photographic data to Earth. The landing probe, which weighed 99 Kg (218 lb), was a hermetically sealed container with radio equipment, a program timing device, heat control systems, scientific apparatus, power sources, and a television system. 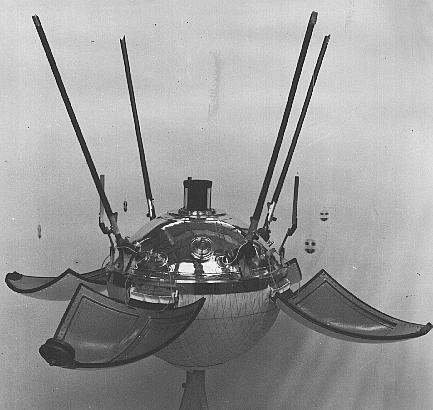 Luna 9 was carried to Earth orbit by an A-2-E vehicle, then conveyed toward the Moon by a fourth stage rocket that separated itself from the payload. Flight apparatus separated from the payload shortly before Luna 9 landed. After landing in the Ocean of Storms on 3 February 1966, the four petals, which formed the shell of the spacecraft, opened outward and stabilized the spacecraft in an upright position on the Lunar surface. The spring-loaded antennas assumed their operating positions, and the television camera retractable mirror system, which operated by revolving and tilting, began a photographic survey of the Lunar environment. Seven radio sessions, totaling 8 hours and 5 minutes, were transmitted as were three series of TV pictures. When assembled, the photographs provided a panoramic view of the nearby Lunar surface. The pictures included views of nearby rocks and of the horizon 1.4 km away from the spacecraft. NASA's Lunar Orbiter 5 impacted the Moon on command at 2.79 degrees S latitude, 83 degrees W longitude (selenographic coordinates). C. Kowal discovered asteroid #1876 Napolitania. NASA launched Apollo 14, the third mission to land humans on the Moon, with astronauts Shepard, Mitchell and Roosa aboard. ESA launched HEOS A2 into a 396km x 244,998km orbit for interplanetary observations. HEOS 2, launched 31 January 1972, was a spin-stabilized spacecraft with a highly eccentric orbit whose apogee occurred at high latitude. Its primary scientific mission was the investigation of interplanetary space and the high-latitude magnetosphere and its boundary in the region around the northern neutral point. HEOS 2 provided new data on the sources and acceleration mechanisms of particles found in the trapped radiation belts and in the polar precipitation regions and auroral zones. It also monitored solar activity and cosmic radiation. The satellite carried a magnetometer and particle detectors which covered a broad range from thermal to cosmic-ray energies. The satellite had three antennas to study extreme low frequency (ELF) waves and carried a sensitive micrometeorite detector. 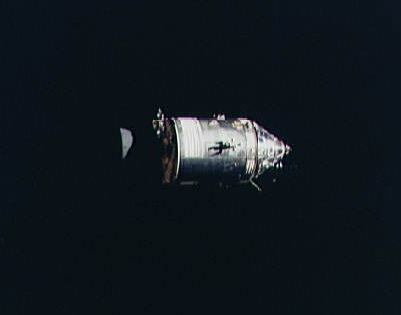 The spacecraft functioned normally until it reentered the Earth's atmosphere on 5 August 1974. NASA's STS 89 (Endeavour 12, 89th Shuttle mission) landed at Kennedy Space Center after the eighth Shuttle-Mir docking flight.